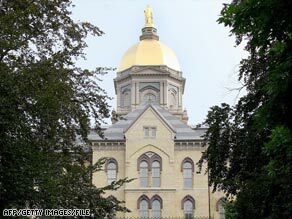 The Catholic bishop of South Bend, Indiana, will not attend graduation ceremonies at the University of Notre Dame because he disagrees with the stem-cell research and abortion views of the commencement speaker — President Obama. Bishop John D’Arcy, whose diocese includes Fort Wayne, Indiana, as well as the university town, said Tuesday in a written statement that “after much prayer” he has decided not to attend the ceremony. “President Obama has recently reaffirmed, and has now placed in public policy, his long-stated unwillingness to hold human life as sacred,” D’Arcy said. “While claiming to separate politics from science, he has in fact separated science from ethics and has brought the American government, for the first time in history, into supporting direct destruction of innocent human life.” Earlier this month, Obama reversed a federal ban on embryonic stem-cell research. Many scientists say the research could lead to advances in treating conditions like Alzheimer’s disease and Parkinson’s disease, while some abortion opponents believe destroying embryos in the research amounts to ending a human life. In January, Obama lifted a Bush administration restriction on funding for organizations that provide or promote abortion overseas. D’Arcy’s announcement comes as anti-abortion groups have launched campaigns attempting to persuade the Catholic university to rescind Obama’s invitation. In a letter to Notre Dame, Anthony J. Lauinger, National Right to Life Committee vice president, called Obama “the abortion president” and said his invitation “is a betrayal of the university’s mission and an affront to all who believe in the sanctity and dignity of human life.” The conservative Cardinal Newman Society has launched a Web site — notredamescandal.com — that, according to the site, has drawn 50,000 signatures to a petition opposing Obama’s appearance at the May 17 ceremony, at which Obama also is to receive an honorary degree.